Choosing a Modern Leicestershire Kitchen. When you put your own individual style on bricks and mortar, that’s when a house becomes a home. And one of the best rooms to do it in has to be the kitchen. The heart of the home. The place where family and friends have been able to gather for centuries to eat, drink and be merry. If the style you love happens to be chic, sophisticated and classy – more like a work of art than country casual, retro or traditional – then the modern kitchen could be for you. But when choosing a modern Leicestershire kitchen, where do you start? 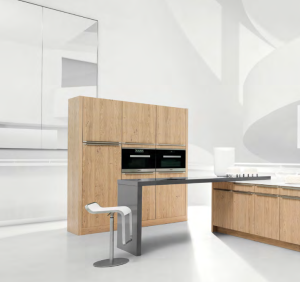 Without a doubt, the modern kitchen should be all about clean lines, minimalism and efficiency. It should ooze sleek, uncluttered style and be striking in its simplicity. You may go for a modern kitchen to complement the rest of your home, or maybe you’re looking for one specific room to make a real statement. Either way a modern kitchen will always make an impression, because sophistication is its middle name. No fussy patterns – think more bold colour schemes such as monochrome with touches of deep red or lime green. Sort your kitchen out today with Dewhirst! If you’re looking to revamp your kitchen to give it a striking and modern style, or even if you’re starting from scratch, then you can sort your modern kitchen out today with Dewhirst. Come along and talk to one of our kitchen experts who can help you discuss the types of design that would most suit your home, not to mention your own individual style. We also have a whole range of appliances to suit the modern kitchen that will help complete the look with effortless style. Choose from some of the big names such as Neff – a company which has built a strong reputation for stylish and reliable products which not only look great but cook brilliantly too. Our range of Neff appliances include cookers, refrigerators and dishwashers that will fit effortlessly into a modern kitchen, adding to the chic and trendy style. To find out more about the kind of kitchens that will look beautifully modern in your home, or to put together your own dreams into one fantastic modern kitchen design, get in touch with us and book your appointment today. This entry was posted in Kitchens on April 9, 2017 by Damian Dewhirst.